So, as Andrea Pirlo, his magnificent mane of hair and an assortment of tight-shirted compatriots saunter into the semi-finals of Euro 2012, it’s time for the OTP Podcast to get the scalpels out and start dissecting another England failure at a major tournament. Why isn’t football coming home? What does Danny Welbeck’s dad do for a living? And was it Wayne Rooney on the pitch, or actually just a small turd? 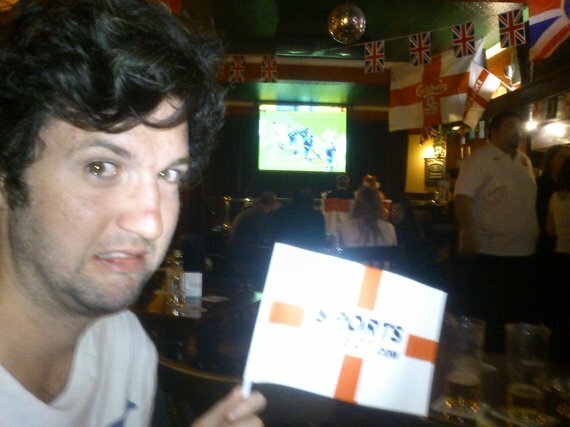 We’ll also be tickling your ear canals with a blow-by-blow account of Ben and Alex’s bizarre viewing of the game, live from a very patriotic corner of Hackney. And if all that moaning wasn’t enough for you, we’ve also got a full roundup of all the quarter-finals (even if they did turn out to be cagier than a high security exotic pet shop), and some smokin’ hot exclusive audio from the likes of Graeme Le Saux, David Seaman, and Claudio Caniggia (plus more), as well as the pod’s very own producer Stu making Terry Venables cranky. The Pod’s Alex showing the strain in the brief moment between the end of yet another rendition of Vindaloo, but before the inevitable England exit on penalties. A moment caught in time. England fans presenting their Anglo-Saxon chubbies in the warm Kiev air in a valiant attempt to put Diamante off as he stepped up to score the winning penalty, and prove once again that in shootouts, weiner takes all.